This superior MS Polymer adhesive will virtually stick anything to everything, even underwater or in the rain. With incredible initial grab and high bonding strength, it will bond porous and non-porous materials, such as glass, plasterboard, brick, timber etc. 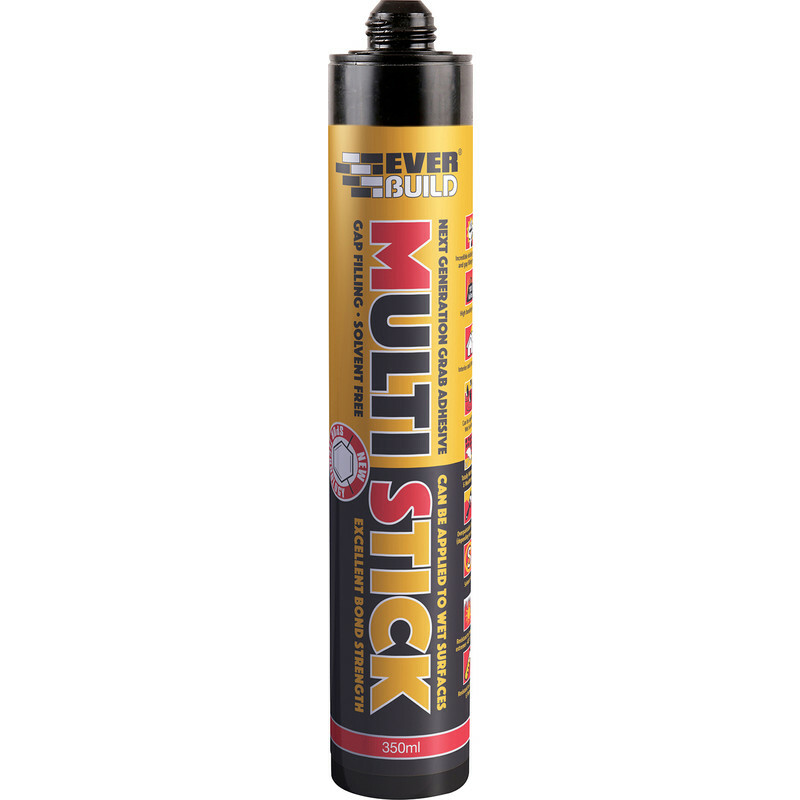 Sika Solvent Free Multi Stick Grab Adhesive 350ml is rated 4.4 out of 5 by 65. Rated 3 out of 5 by Boss12345 from Wrong application Ordered this for attaching coving and skirting board but it is way too thick and would not dispense through a standard silicone gun. All I could do was remove the nozzle and dab a small amount in stages. Wear gloves as not easy to get off your hands. On the plus side it would be good for other applications as it is extremely strong and I would agree that it could be used well underwater!. Rated 5 out of 5 by Taffy70 from Great product I had a slate on the roof that had come away during heavy wind. The slate slid down and stayed in the gutter. I bought this on a recommendation from a builder. Extension ladders out and a cat ladder for the roof I climbed onto the roof. Multi stick onto the slate and slid into place, just worked wonderful. You can’t see which slate I’ve repaired it’s grest. Rated 3 out of 5 by Chippydave65 from Ok but very thick! After reading the reviews, I thought I'd try this instead of the normal PU40 I use to stick in a bath. I found it stuck very well, but because of its 'thickness when extruded from its tube, it caused a larger than I'd like gap around the perimeter, so wouldn't use it again. Rated 1 out of 5 by crailman from too thick to use or get through nozzle I bought this for sticking laminate panels to wall and batten. Could not squeeze it up the nozzle. Without the nozzle it came out with force and stood upright. Never seen a mastic this thick. Temperature about 10 degrees. I am trade, finding radiators to warm it on not an option and expensive waiting. Rated 5 out of 5 by essieboy from Great grab adhesive Very happy with this grab adhesive. Nice glupy consistency if that's a word haha, you need hands of steel to apply it tho as it takes some force to keep a good flow coming out of the tube, but it has a excellent grab to it. I would buy again for sure. Better than the cheaper alternatives in my opinion.